I took the 11th day of Christmas "off" from bloggin', as the 11th day is also my birthday... Today's DIY, a day late, is something I got to crash-test during my birthday festivities... Enjoy! 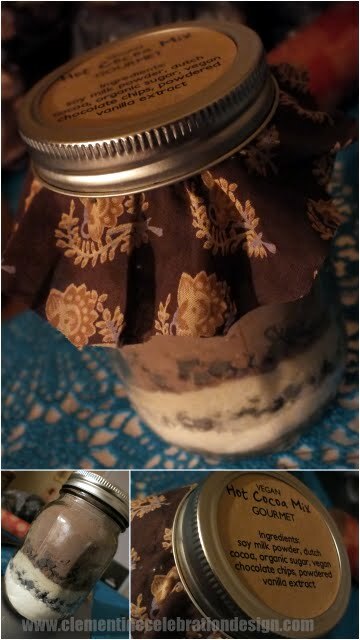 I've always loved the idea of gifting hot cocoa mix in mason jars. Fortunately, for my omnivore friends all I really need to do is slap a few classic ingredients together, a layer of marshmallows or candies, and it's good to go. For a vegan alternative, it was a little trickier to get the same overall effect--both taste and presentation. My first step was to hit up a health store (in Thunder Bay, Kelly's or Bonobo's) for vegan milk powder, vegan cocoa powder, organic sugar, and vegan chocolate chips. Powdered vanilla extract I already had handy from other recipes. I mixed 3/4 cup of sugar and 2tsp powdered vanilla to make vanilla sugar, and a cup of the cocoa with a cup of milk powder (sifted). Sifting is key!! Next, I layered a cup of milk powder (soy this time, for lack of coconut in the store I was at), chocolate chips, the vanilla sugar, more chocolate chips, and then as much of the sifted cocoa/milk mixture as would fit in the bottle. You could choose to layer in a different order if you like, or add more or less of each ingredient based on your recipient's taste... I finished it off with a cute kraft label and a fabric scrap for the thrifty-chic look it deserved. This recipe was most successful when heated over stovetop and allowed to boil ever so slightly... which is something most people find with cocoa in general. Try it for yourself! Do you have any tricks for perfect hot cocoa? Cinnamon or candy canes, perhaps?